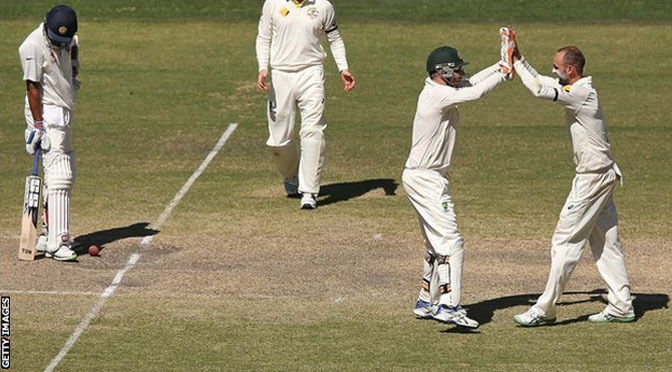 Australia drew the third Test against India to take an unassailable 2-0 lead in the four-match series. The home side declared on 318-9 at lunch on the final day, setting India 384 to win in 70 overs. Virat Kohli (54) and Ajinkya Rahane (48) led India’s resistance after they lost three wickets for 19 runs. Captain Mahendra Singh Dhoni and Ravichandran Ashwin then survived a nervous final hour to push India to safety, as they closed on 174-6. Australia resumed their second innings on 261-7 and had been expected to bat aggressively to add runs quickly before declaring, but Shaun Marsh and Ryan Harris took their time in a 69-run partnership, also knowing a draw would be enough for Australia to clinch the series. Marsh was run out for 99 shortly before lunch as he attempted a rash single to bring up his first Test century on home soil. After the break, Harris struck with the second ball of the second over to dismiss Shikhar Dhawan for a duck before Lokesh Rahul continued his forgettable Test debut by falling for one to a Mitchell Johnson short ball, following his three in the first innings. Josh Hazlewood then claimed his first Test dismissal of the Test, trapping opener Murali Vijay lbw for 11 to leave India 19-3 after 8.2 overs. But Kohli and Rahane steadied the innings to leave Australia needing seven wickets in the final session. Kohli fell to the first ball after the tea break, caught at backward square leg, before Chetshewar Pujara was bowled by Johnson for 21 while Rahane was caught at mid-wicket off Hazlewood, to leave India on 142-6 with 15 overs remaining. 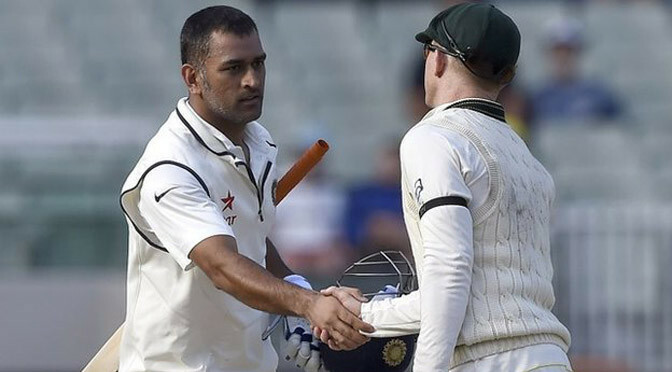 However, Dhoni, who announced his immediate retirement from Test cricket after the match, and Ashwin saw off 11 of the overs before a draw was mutually agreed with four overs remaining. 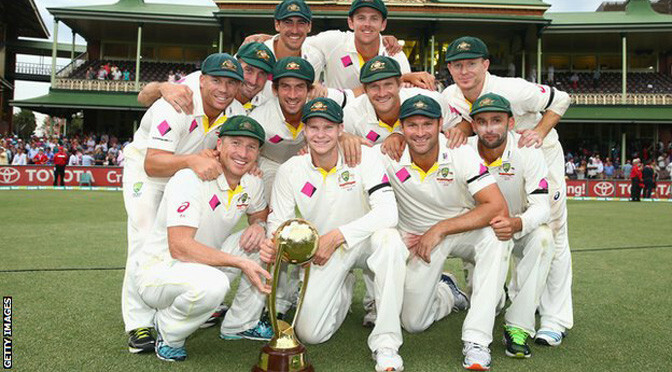 The result sees Australia regain the Border-Gavaskar trophy. Australia stand-in captain Steve Smith hit a second century in two games to help leave the second Test with India finely poised. Deputising for the injured Michael Clarke, Smith made 133 as the hosts posted 505, a first-innings lead of 97 at the Gabba. Mitchell Johnson struck 88 as Ishant Sharma (3-117) and Umesh Yadav (3-101) shared six wickets. India reached 71-1 by the close of day three, trailing by 26. India’s Murali Vijay, who made 144 on the first day, fell in the evening session when he played on trying to leave a delivery from Mitchell Starc. However, Shikhar Dhawan and Cheteshwar Pujara negotiated a tricky final period without further loss and will resume on Saturday on 26 and 15 respectively. 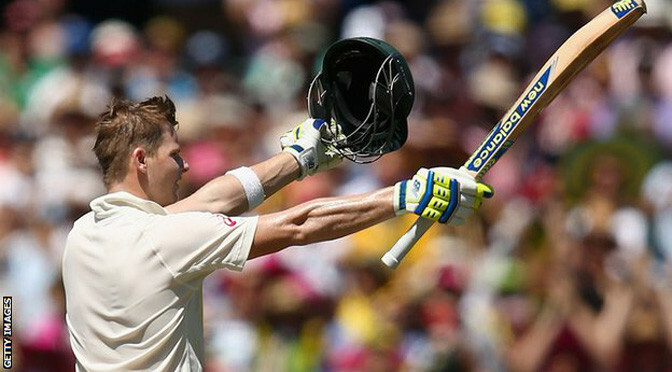 Australia began the day on 221-4 and Smith, 65 not out overnight, brought up his sixth Test hundred off 147 balls before he chopped on off Ishant. 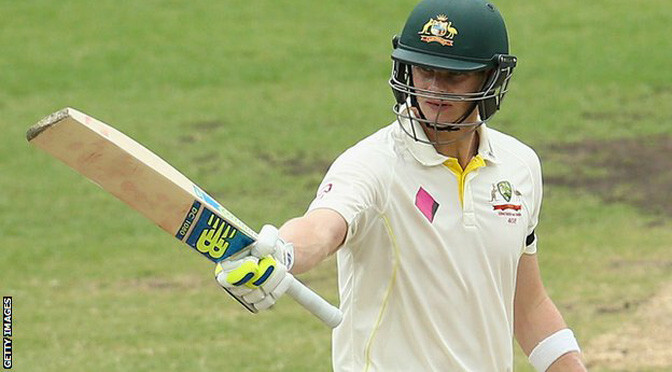 He made an unbeaten 162 and 52 not out as Australia won the first Test by 48 runs. Starc (52) and debutant Josh Hazlewood (32) helped boost Australia’s total with some valuable late-order hitting. 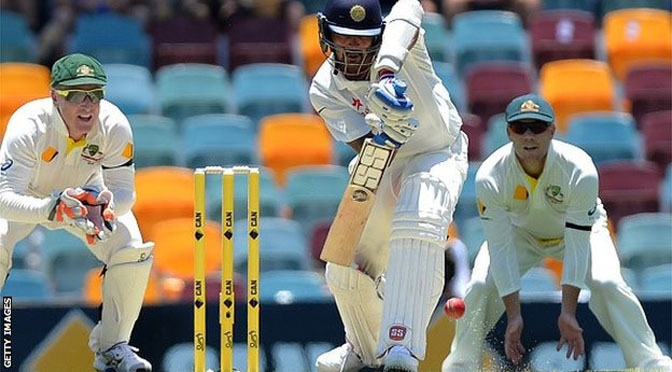 Murali Vijay struck an impressive century as India put themselves in a commanding position on day one of the second Test against Australia. The 30-year-old batsman scored 144 as India reached 311-4 at stumps after winning the toss at the Gabba. 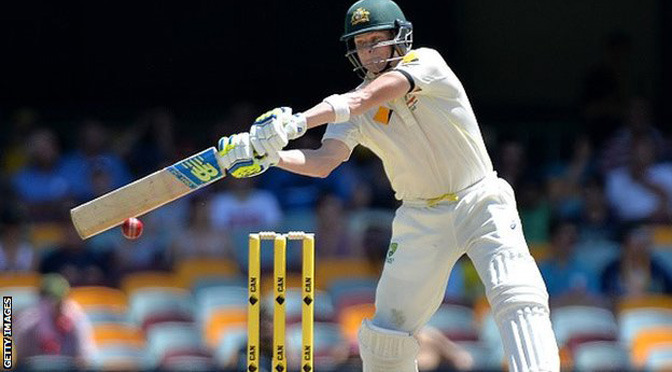 Australia endured a difficult day in Steve Smith’s first Test as stand-in captain for the injured Michael Clarke. 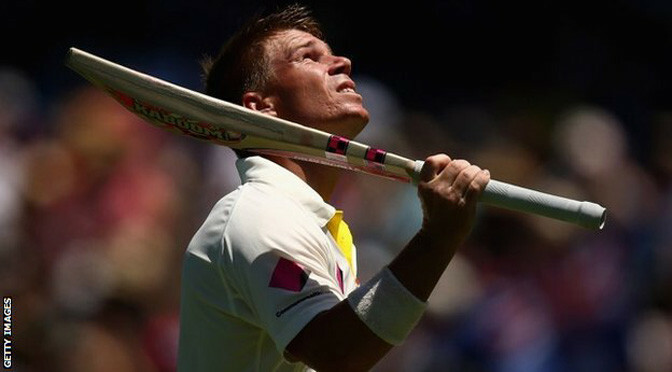 In stifling heat Smith used eight bowlers as injury and fatigue took its toll on the Australia attack. Mitchell Marsh pulled up with a hamstring injury, Mitchell Starc and debutant Josh Hazlewood left the field with exhaustion and Mitchell Johnson bowled through a hip problem. Opener Vijay’s hundred continued his fine start to the four-match series, with scores of 53 and 99 in India’s 48-run defeat in the first Test. Vijay was put down by Shaun Marsh on 36 and 102, both off left-arm pace bowler Johnson, before he was caught behind off spinner Nathan Lyon late in the day. Mitchell Marsh struck first when he removed opener Shikhar Dhawan, his maiden Test wicket. Hazlewood, the pick of the Australia attack, had Cheteshwar Pujara controversially caught off the grille of his helmet, then found Virat Kohli’s edge as he tried to cut, leaving India 137-3. But Vijay dominated a weary attack as he and Ajinkya Rahane shared a 124-run stand for the fourth wicket. Rahane and Rohit Sharma will resume on day two on 75 and 26 respectively. Off-spinner Nathan Lyon took 10 wickets in a Test match for the first time in his career as Australia beat India by 48 runs in the first Test at Adelaide. India fell short of their target of 364 from 98 overs despite captain Virat Kohli’s 141 and Murali Vijay’s 99. Lyon took 7-152 in the second innings to finish with match figures of 12-286. But Australia captain Michael Clarke injured his hamstring while fielding and will miss the rest of the four-match series. Australia declared on their overnight total of 290-5, and India looked comfortable in their pursuit of 364 as Kohli, deputising for the injured MS Dhoni, and opener Vijay put on 185 for the third wicket, to take India to 242-2. Vijay fell in the 10th over after tea, lbw to Lyon one short of his century, and India’s hopes further dimmed when having completed his second century of the match, Kohli was caught on the mid-wicket boundary by Mitchell Marsh off the bowling of Lyon. Ishant Sharma was last out, stumped by stand-in captain Brad Haddin off Lyon, as Australia – wearing black armbands to honour their late team-mate Phillip Hughes, who died on 27 November, two days after being struck on the head by a ball during a Sheffield Shield game – wrapped up the win to take a 1-0 lead in the series. Lyon, who was named as man of the match despite David Warner and Kohli both scoring hundreds in each innings, said Australia remained confident of winning, even when Kohli and Vijay seemed well set. “It’s Test match cricket, and there are always little turns and stories in the game. but we knew that if we stayed patient long enough, things would turn around,” he said. 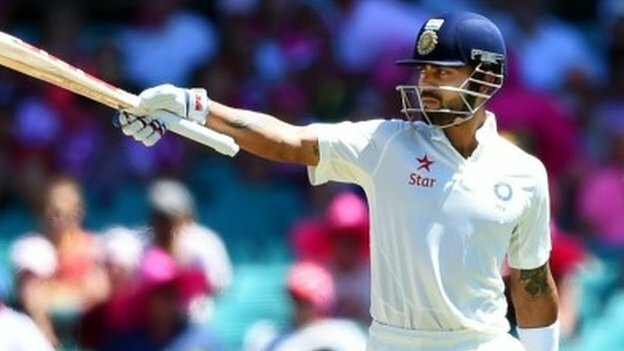 Kohli said India were determined to try and chase down the target rather than play for a draw at the Adelaide Oval. “I told the guys last night that we had to come out tomorrow and chase it. I believed throughout in my own ability and the ability of the guys,” he said. Clarke said his side particularly wanted to record a victory in their first match since the death of their former team-mate Hughes. “I think winning games of cricket are based on skill not emotion, but when you get the result you’re after I think that’s probably when you see the emotions come out,” he said.